A detail of a Japanese Woodcut in the “Ukiyo-e to Shin Hanga: Japanese Woodcuts from the Syracuse University Art Collection” exhibition currently at Foosaner Art Museum. Comprising 40 works by more than 20 notable Japanese artists spanning more than 200 years, the exhibition runs through May 24. It looks at works from three periods: Ukiyo-e (1780-1868 color-filled print making); Meiji (1868-1912); and Shin Janga (1915-1940s, more impressionist). All the works in this traveling exhibition were curated by Andrew Saluti, assistant director of the Syracuse University Art Galleries. The Foosaner also has a related exhibition, “Looking Inward: Japanese Artworks from the University Museums Collections.” That concurrent exhibition comprises works from the Foosaner’s own collection and those on loan from Florida Tech’s Ruth Funk Center for Textile Arts. That exhibition includes kimono, Haori, Japanese prints, ivory carved swords (wakizashi) and decorative art objects. 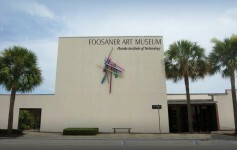 The Foosaner Art Museum is owned and operated by Florida Tech. The Foosaner is at 1463 Highland Avenue, Melbourne. Hours are 10 a.m. to 5 p.m. Tuesday through Saturday, 1 to 5 p.m. Sunday, and 10 a.m. to 7 p.m. Thursday. Admission is $5 general, $2 seniors, children and students. Free for Museum members and Florida Tech staff, faculty and students. 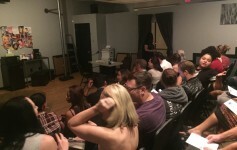 Thursdays are free for the general public. 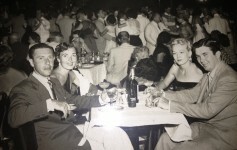 Visit www.foosanerartmuseum.org or call 321-674-8916.